This is a directory of boer-goat-wisconsin and if you wish to add your details or change details then please use the Directory Form. 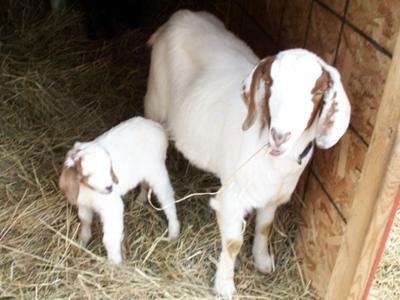 I Am Goat Farm - Dave & Connie McFarlin, W489 Hesch Valley Rd, Waumandee, WI 54622. 608.626.2014. cdmac@met.net. Raise Boer Goat Cross for Meator 4-H project. Krebs Kidz Boer Goats - Mark and Gail Krebs W6634 Franklin Road, Monroe, WI 53566 mrskrebs@tds.net Raising percentage and High Percentage Grade Boer Goats. 4Y's Farm - Raising percentage and purebred Boer goats along with LaMancha dairy goats. Dave & Shellie Yahnke, Edgerton, WI 53534 - 608-289-0255.